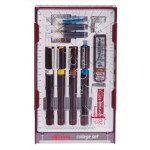 College 3 Pen SetContains:3 rapidograph pens (0.25mm, 0.35mm 0.50mm)1 Tikky burgundy 0.5mmhi-Polymer HB leadsB20 eraser3 pen stations3 ink cartridgescompass attachment..
College 4 Pen SetContains:4 rapidograph pens (0.25mm, 0.35mm, 0.50mm & 0.70mm)12 hi-Polymer HB leadsB20 eraser6 ink cartridges1 compass attachment..
Rotring Clutch Leads 0.5mm 12pc. High polymer fine leads are a strong foundation for you to build on. 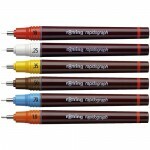 0.50mm Rotring leads available in HB,2B, and 2H. ..
100ml . 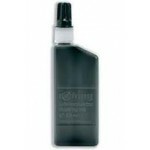 For Cleaning Drawing Instruments used with Non-etching Drawing Inks. . 100ml of Concentrated Technical Pen Cleaner for Cleaning Dirty, Encrusted Technical Pens and Nibs. . Use Dissolved in Water. .. Complete Pen. 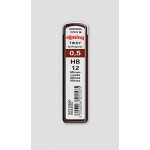 Please select nib size from Available Options.High precision technical pen with rOtring’s unique capillary cartridge, in many line widths. 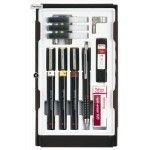 Wear-resistant, hard chrome-plated thin tip allows working in exquisite detail. Innovative cartridge including the ink helix for easy maintenanc..
Rotring Cartridges Pk 3 for Rapidograph pen BlackQuality pigment ink. Suitable for tracing paper, vellum, drawing paper and lineboard. Easy flowing, high opacity, good adhesion. Smudge proof when dry, waterproof, lightfast and suitable for all forms of reproduction. 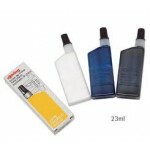 ..
Rotring technical pen cartridge ink blue pk of 3Quality pigment ink. Suitable for tracing paper, vellum, drawing paper and lineboard. Easy flowing, high opacity, good adhesion. Smudge proof when dry, waterproof, lightfast and suitable for all forms of reproduction. 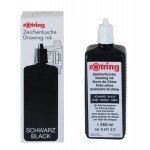 ..
Rotring, Rapidograph Technical Pen ink cartridges Red pk of 3Quality pigment ink. Suitable for tracing paper, vellum, drawing paper and lineboard. Easy flowing, high opacity, good adhesion. Smudge proof when dry, waterproof, lightfast and suitable for all forms of reproduction. .. Replacement cones (nibs). 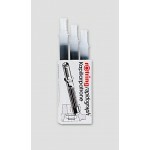 Rotring Rapidograph Technical Pens cones available in 0.7mm, 0.5mm, 0.35mm, 0.25mm, 0.18mm & 0.13mm. Please specify size required in the Available Options ..
Black - Squeeze Bottle - For Technical Pens - 23ml ..
Blue - For Technical Pens - 23ml ..
Brown - For Technical Pens - 23ml ..
Red - For Technical Pens - 23ml ..
Black - Squeeze Bottle - For Technical Pens - 250ml ..
Rotring Tikky Clutch Pencils. 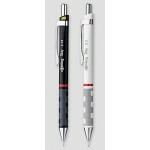 This premium fine-lead pencil in the familiar four line widths can now be used for virtually any occasion. Extremely comfortable hold thanks to the new dual-material grip and new barrel design. 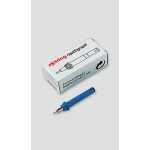 A high-quality eraser and refillable hi-polymer HB leads under the ..